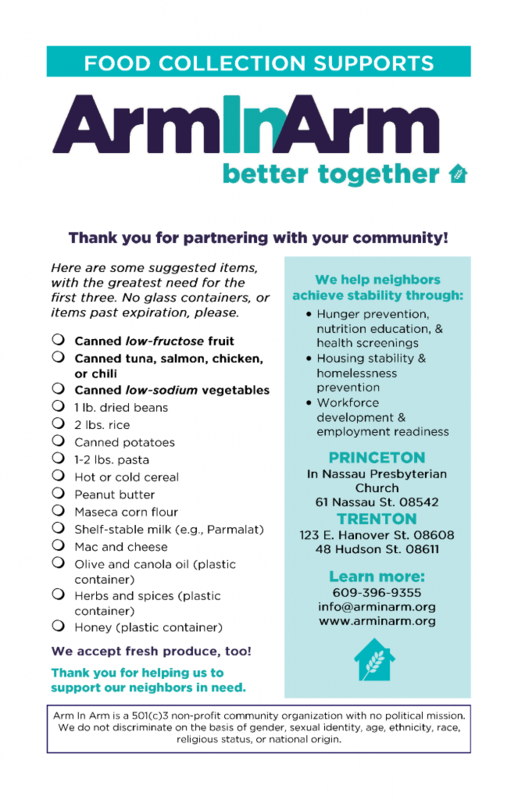 Nassau Presbyterian and Trinity Episcopal Church are partnering to collect 10,000 pounds of much needed supplies for Arm in Arm’s three food pantries! A list of needed items is below. Please bring your donations to the Conference Room on Sunday, December 9 and Sunday, December 16. There is also always a bin inside the ramp door for Arm in Arm food pantry donations. Thank you for the continued support of Arm in Arm, especially as we work to make sure families have food for the holidays! Download a printable copy of the food list Shopping List (pdf) or pick one up at the church.